YES YOU CAN Ride in the Winter Months | Hupy and Abraham, S.C.
Much like you can choose to go skydiving, or try to fight a lion, you can, in fact, ride in cold weather conditions. It just takes a little bravery, a little ingenuity, and a temporary lack of better judgment. Winter riding isn’t for everyone. 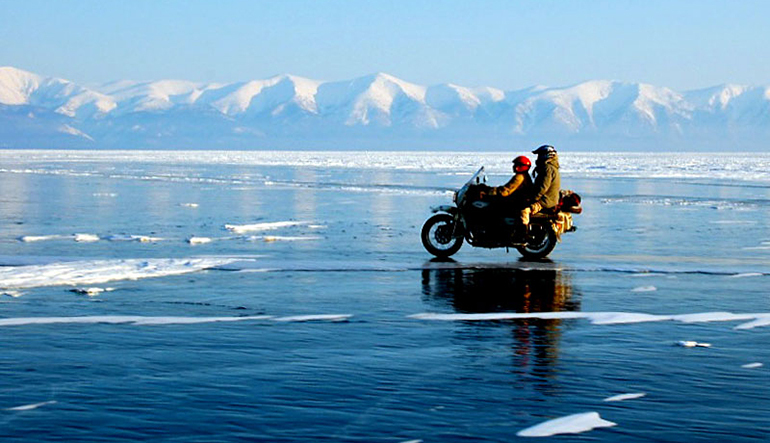 There’s no doubt that the salt and the cold are hard on both man and machine, no matter how prepared you are. But if you’re bound and determined to quell the itch to ride during January, or just want to be prepared for alternate weather conditions, there are some options to make it safer, and possibly more bearable. Be Educated: Your tires are harder, you’ll get exhausted easier, you’ll have less grip and feel on the road, you may get stiff, you may get sleepy. When does the sun go down? What’s the weather pattern for the area? What will the wind be like? How often will you stop? Will it be enough? Are you prepared to make an emergency stop if necessary? These questions are just the tip of the iceberg when preparing for a cold weather trip. Listen to Both Machines: Riding in the cold is dangerous. A lot of what we do as riders is dangerous, however this is a separate kind of risk. The cold slows not only your body, but your mind as well. Your reflexes lag and you expend more energy as your body struggles to maintain heat, making you tired, which is additionally dangerous. While riding in the cold keep a constant check on your bike’s status, and your own. Stretch and flex regularly, and if you start to feel drowsy, mentally OR physically, pull over and regroup, or ideally stop for the day. 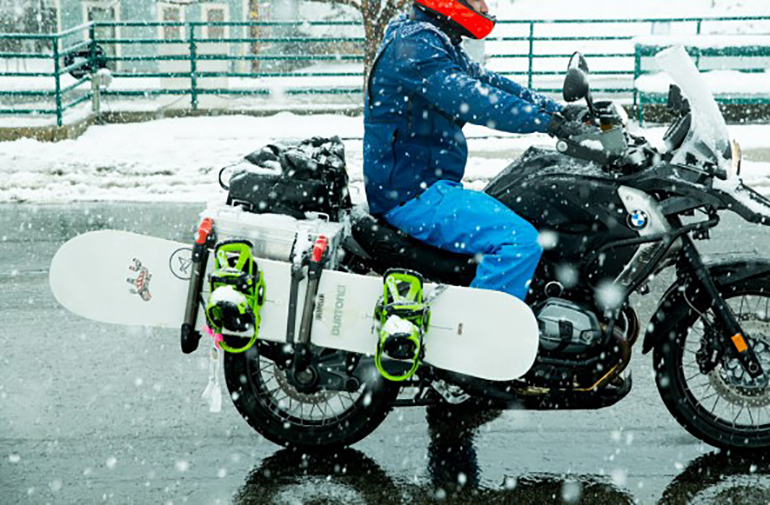 Become Tech Savvy: If you have decided that riding past snowbanks is now a life goal then quality gear and gadgets have just become your new best friends. Staying dry is a top priority as convection from wet gear combined with the windchill will spell plummeting body temperatures for you. The simplest way to keep dry during winter riding is a windproof, one-piece, lined riding oversuit. Additionally, attachable windshields and anti-fog visors will also help protect against the elements, and preserve visibility. Improvise: Almost anyone can be caught off guard by a cold snap. Consider keeping handwarmer heat packs somewhere on your bike. Although not ideal, they’re an easy-to-store godsend in a quick pinch. If you’re in a bind and just need to get by, bubble wrap and newspaper are surprisingly effective and stylish insulators. Making a quick newsstand stop to stuff these items where the wind hits hardest (jacket zippers, body core and thighs) works shockingly well. Get Electric: There are so many electric options out there today for cold riding it’s almost cheating. If cheating was extremely helpful and potentially lifesaving. Look into electric gear, when safety’s at stake you’ll be thankful for every volt. 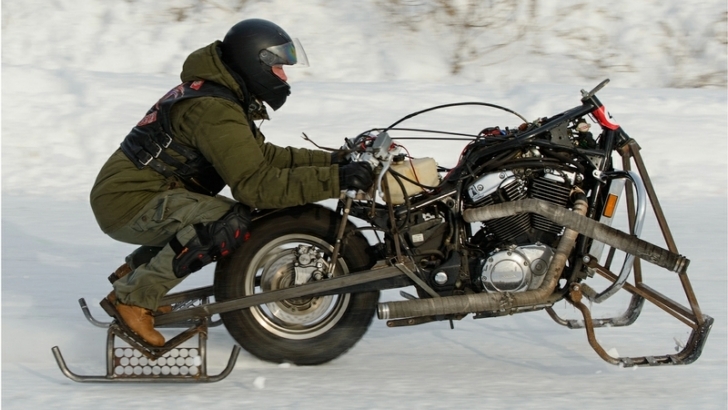 Know When to Say No: At some point, no matter how prepared you are, cold weather riding can just be downright unsafe. Keep an eye on the radar, forecast and visibility. And when in doubt, call it off so that you’re ready and able to ride another day. At Hupy and Abraham, S.C., we encourage you to have a safe and warm winter season, no matter your hobby. If it’s too rough to ride outside don’t despair, check out our 6 Winter Options for Trapped Riders, and support the sport by ordering your free Watch for Motorcycles sticker here.